Gazing around the increasingly Gallic-themed streets of central Hong Kong’s entertainment districts, where cafes, brasseries and even tartine shops are now de rigueur, some weary diners may well wonder if the city really needs another French restaurant. The answer, judging from the response to new ‘neo-Parisian’ bistro Belon, appears to be yes. 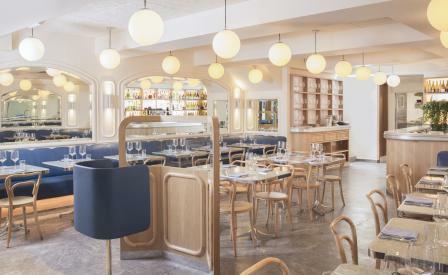 But then Belon has a few distinguishing characteristics -- not least head chef James Henry, who teamed up with local restaurant group Black Sheep to open the venue after the demise of his previous venture, popular Parisian eatery Bones. Then there’s the design, by Hong Kong-based Dix Design + Architecture, the visual force behind now near-iconic properties like Yardbird and Carbone. Mirror-clad walls, polished surfaces of marble and aluminium, and snug deep-blue booths give Belon a vibe that’s both classy and comfortable, a rarity in a dining scene that typically veers between scruffy and antiseptic. The cuisine is similarly sophisticated yet sincere. While the menu shifts according to what Henry can source at nearby markets and farms, there are always a few well-executed classics like whole roast chicken with pommes Anna, balanced with more daring dishes that exhibit an Asian influence, such as the sea urchin and sweet potato waffle. It seems Hong Kong’s culinary French revolution isn’t quite over yet.